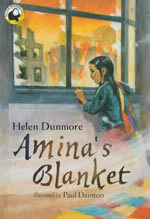 As Josie and the other children in her class make a beautiful patchwork quilt to send to a war-torn country, Amina is shivering in her darkened flat. Shells are exploding in Amina’s city. There is no electricity, and her mother has gone out to get wood. Amina is alone, but in her pocket she has a friend: a pet mouse called Sinta. Josie falls asleep under the patchwork quilt, and dreams of Amina. In Josie’s dream the two girls meet and make friends, and Josie learns what it’s like to live in a city at war. For ages 7 - 10, Amina’s Blanket is beautifully illustrated throughout by Paul Dainton.